Addison McKnight began her writing career in 2004 with "Tuscaloosa News." She holds a Master of Science in Nursing from the University of Alabama and is currently working on a degree in nutrition and fitness. When she is not working full-time at UAB Hospital, McKnight is writing and copy editing. From baseball games to grilling outdoors, hot dogs delight the taste buds of those young and old. Although the most common type of hot dog, or wienie, consists of a variety of meats including pork and beef, there is a healthier option. Chicken hotdogs contain fewer calories and less fat than the traditional pork and beef version. They also offer more protein, 14 grams in total, which is three times the amount found in a regular hot dog. When it comes to cooking a chicken hot dog, there is no difference. You can microwave, boil or bake it, just like the traditional type. Boil them in water. Fill a saucepan halfway with water. Place the pan on the stove and turn the heat on medium-high. Once the water begins to boil, place the chicken hotdogs in the pan. Boil the hotdogs for five to eight minutes, or until they begin to burst open. Microwave the chicken hotdogs. Place the chicken hotdogs on a microwavable plate and put it in the microwave. Cook the hotdogs on the high setting for one to two minutes, depending on your microwave. Serve hot. Bake the hotdogs. Place the chicken hotdogs on a baking sheet and place into a 350 degree F preheated oven. 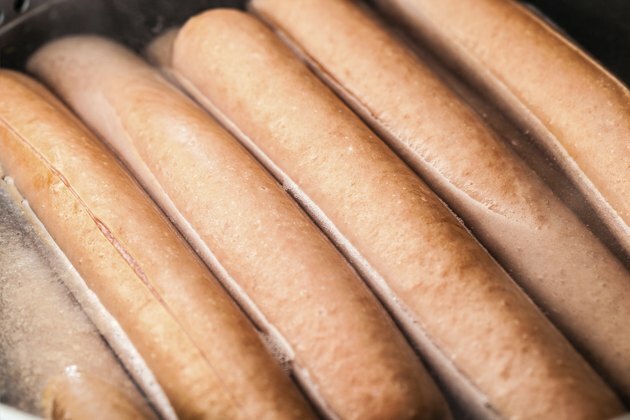 Bake the hotdogs for 15 to 20 minutes, or until they are swelled and the outer skin is parched. Deep-fry the chicken hot dogs. In a heated deep fryer, drop the chicken hotdogs into the hot oil. Allow them to cook until the outer skin turns slightly brown, which should take three to five minutes. Remove the chicken hot dogs from the hot oil and drain them on a paper towel lined plate.